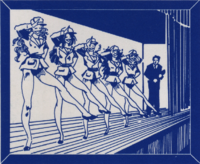 Terran Confederation Service Organization dancers from Claw Marks. A Terran Confederation Service Organization band from Claw Marks. The Terran Confederation Service Organization or TCSO was a group dedicated to improving the morale of those serving in the Terran Confederation military. In April 2654, the Terran Confederation Service Organization announced to the Terran Confederation Armed Forces CommNet that it would be sending an entertainment unit to the TCS Tiger's Claw. The unit included normal and zero-g dancers, singers, comedians and the Confederation's best cyberlink illusionists and was accompanied by vidstar Saranya Carr. The event was advertised on the back cover of Vol. 1 No. 4 of Claw Marks. Four shows were performed in Vidroom 3775 on 2654.140. This page was last edited on 12 August 2010, at 12:34.